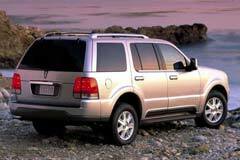 The Lincoln Aviator was produced for the 2002 to 2005 model years. It is a mid-size SUV that is equipped with a 4.6L V8 engine that produces 302 hp and 300 lb ft of torque. Its 5-speed automatic system can be coupled with two or four wheel drive. Lincoln Aviator had three trim levels; Luxury and Premium and Ultimate. The luxury model is equipped with adjustable pedals, rear pack assist, leather upholstery, and dual zone climate control. On the other hand, the Ultimate and Premium models are equipped with heated and cooled seats, HID headlamps, stability control, rear seat entertainment system and a moon roof. Besides the center-stack design that is complemented by leather trim and contrasting wood, Lincoln Aviator features large, classy analog dials with brilliant red needles and white numbering on the instrument panel. Additionally, it offers ample rear leg room especially in the third row. This middle size SUV can sit six or seven; however, this depends on whether it has a second row split bench seat or captain-chairs with a center consol.